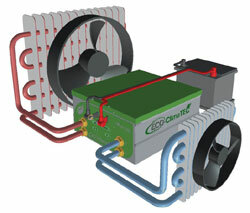 Top-Cool is proud to introduce the ECO-ClimaTEC. The ECO-ClimaTEC is able to cool or heat every single component in the vehicle like airco, cargo, seating, electronics, battery and so on and is based on a easy to fit and easy to install Thermo Electric Cooler. Never was integrating cooling features so easy thanks to the plug-and-play functionality of this new modular low pressure water circulating eletric cooling system. 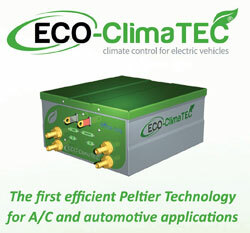 Making use of only environmental friendly materials and using water as main cooling liquid, the ECO-ClimaTEC operates as an clever and efficient cooling/heating device and realises a high efficient heating process by creating a heat pump effect that uses waste energy of other components in the vehicle. The system is the solution to green minded vehicle builders that are looking for a clever and environmental friendly system they can use in their vehicles. 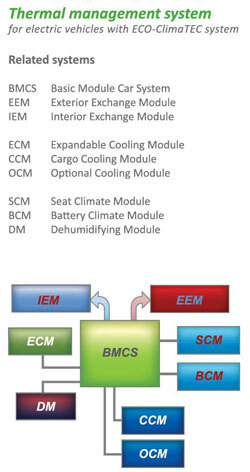 By simple not wasting any valuable cold/hot energy by redirecting this directly to the desired location in the vehicle, the system is setting a new approach for efficient cooling and facilitates all kinds of new smart possiblities for the automotive industry like spot cooling, active seat-cooling and many more. This advanced cooling and heating system utilises patented Peltier technology with the use of standard TCT-units from the renowned and entrusted PowerPack-series. The ECO-ClimaTEC is provided with the first generation of TCT-cooling modules and is on his way to solve the lack and the need for cleaner cooling and heating devices in the electric vehicle industry. The state of the art cooling module is based on patented Peltier technology called TCT (Top-Cool Technology), which has allready proven its green functionality and durability in many different market segments. This Thermo Electric Cooling technology drives the Peltier element to its maximum performance thanks to the direct liquid surface contact and integrated internal turbulators. The Peltier elements are embedded in flexible rubber gaskets and are tension free assembled. While "floating" in rubber, the surface area remains free for flexible direct contact with the cooling liquid for maximum heat transfer. Because of this advanced "flexible and floating" assembly of the Peltier elements, the technology is suitable to be used in vibrating and shocking applications. It is also a perfect solution for switching warm to cold situations thanks to the build in switch. The technology achieves the worlds most compact and powerfull cooling performance and sets the fundamentals of how future cooling will look like in high performance Thermo Electric cooling applications. With no moving parts and a solid state ATEX certified housing, the water cooled unit is a multiple applicable cooling device and is ready to change the worlds perspective for a greener cooling solution.